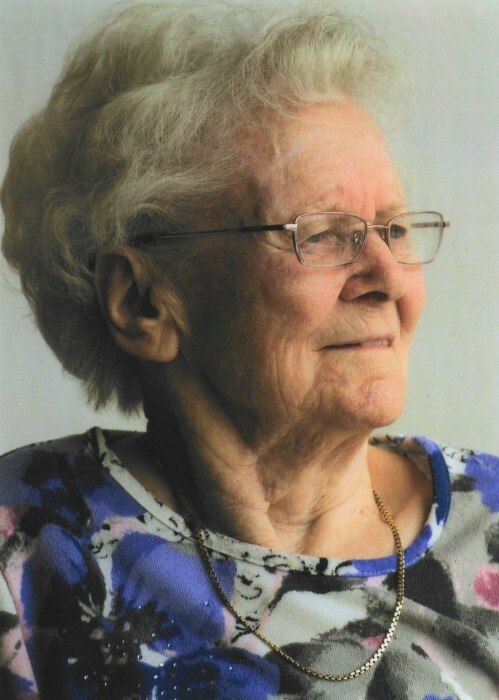 Mrs. Olga Schweitzer of Edson, beloved wife of the late Mr. Paul Schweitzer, passed away peacefully on January 27, 2019 at the age of 94 years. After high school, Olga attended McTavish Business School and worked for Muttart Lumber Company in Edmonton. She married Paul Schweitzer in 1947 and they operated a farm near Hay Lakes. In retirement, they moved to Edson. Olga became involved with the United Church and made new friendships there. She often volunteered at the Thrift Store and enjoyed gardening and watching the Toronto Blue Jays. She was an avid card player who often won the cribbage games. Olga was known for her sense of humour, generosity and kindness shown to everyone. She will be greatly missed by family and friends. Your comfort and support are greatly appreciated and gratefully acknowledged. Olga will be lovingly remembered by her daughters Rita Suter (Mike Choloniwsky) and Linda Todd (Michael; grandson Brett Aubrey (Joscelyn); and great-grandson Everett Aubrey; as well as numerous nieces, nephews and their families. Olga was predeceased by her husband Paul in 2002; and her four sisters and one brother. A Memorial Service will be held at 1:30pm on Wednesday, February 13, 2019 at Foothills Memorial Chapel, 5040 – 6 Avenue, Edson, AB., with Reverend Kimberly Roy, officiating. For those who wish, memorial donations may be made to the Parkland Senior’s Lodge (4716 - 5 Ave., Edson, AB T7E 1S8), or to the charity of your choice. The family wishes to express their deepest appreciation for the high quality of care given to Olga by Dr. Lise Wannenburg and the staff and nurses at the Edson Continuing Care Center.